This morning I’ll take a pause on paws. No more writing about puppies, at least not for today. The Archives, here, began with the intention of capturing ordinary moments and discovering something extra-ordinary within them. Typically, I have written from the present, recounting something as it has been unfolding, perhaps yesterday, or even now. I consider this last week’s puppified posts, and realize that I’m telling the tale of events that unfolded last month. Meaningful moments that were not shared here in the Archives as they were happening. Why? Though it may sound silly, the path to our puppy has been just too fresh. Too sensitive. The layers of emotion brought up within me, the thoughts that have swirled through my analytical mind, have all been too tender to type about. I suspect the delicacy runs deep through old experience. Past posts have touched on the farewell to my dog twenty years ago. But I’ve yet to write about my early days of mothering my own human child, the one who now is twelve. There was the loneliness of my dream coming true being his greatest fear realized. There was the trying between us. There was the inevitable failure. There was me and a nine-month old, and little support. There were a string of house-sitting jobs, and the good graces of others. There was work for little pay, and a lot of mac and cheese. 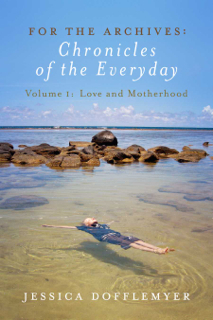 There was the realization that my lifetime’s longing-motherhood-had come to be. And the reality of that dream was painfully difficult to live. I could handle the survival mode we existed in, but the self-doubt, the loneliness, and the accusations I hurled at myself, were the toughest to reconcile. Perfectionist that I was, my life situation appeared, not only imperfect, but a complete folly. The circumstances seemed to be the life of someone else, not the world in which I imagined myself. But that was eleven years ago, and over time the tides have turned and mellowed. I live in a house and pay my own rent. I have a husband that is a loving, and supportive life partner. I have a healthy and compassionate son. I don’t know the last time I ate mac and cheese. And our family is fortunate enough to have the luxury of bringing a puppy into our lives. So why so touchy? It’s just a puppy, I know. But it’s sensitive. Children are such change agents! Puppies can be, too. Maybe this time the change will be about unconditional love — a pretty fine situation to manage! Yes, on the unconditional love! Learning so much already…slowing down. Taking time. Listening to subtle cues from big puppy eyes. Enjoying immensely! Thanks for chiming in! I’m exhaling… thank you for this. Some of my own past experiences have been as hard & I’ve been having doubts about bringing a kitty into my life. Thank you for writing your truth. A. An animal in our midst has added responsibility, of course, but she brings so much joy…and unconditional love. Sweetness abounds!